I like it when someone besides a few financial bloggers takes the gloves off and starts asking some hard-hitting questions. In Cross Asset Research last week, Albert Edwards at Societe General did just that. Emphasis in italics is mine. Fragile and vulnerable in itself, the US recovery now battles against the rest of the world, which like a horror movie is dragging it down into a hellish Ice Age underworld. The problem is that at these stratospheric valuations, the market does not need to suffer an ACTUAL recession to see a crash. Like October 1987, just the fear of recession will be enough to trigger a massive market move. On these pages we have a very simple thesis as to what will bring an end to this grotesque, QE-fueled market overvaluation. Simply put, the central banks for all their huffing and puffing cannot eliminate the business cycle. And they should have realised after the 2008 Great Recession that the longer they suppress volatility, both economic and market, the greater the subsequent crash. Will these morons ever learn? The problem is that most risk assets, and especially equities and corporate bonds, are very expensive and priced for a long cycle. Meanwhile, this recovery has failed to generate any cyclical upward pressure to inflation – indeed quite the reverse. The global economy resembles a knackered old V8 engine which is now only firing on one cylinder (US). Hence, any data suggesting that the US economy is now also flagging were always likely to cause a meltdown as investors feared the imminent arrival of Japanese-style outright deflation. 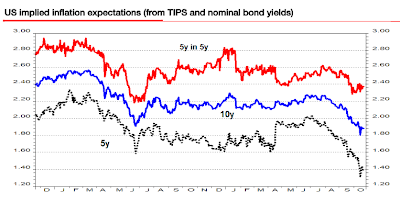 We note with interest that US 5-year inflation expectations in 5 years’ time have not fallen anything like as quickly as 5y expectations (see chart below). This suggests to me a continued misplaced market (over)-confidence about central banks’ ability to control events. Only one day before last Wednesday’s flash crash, Guy Debelle, head of the BIS market committee, said investors had become far too complacent, wrongly believing that central banks can protect them, and many staking bets that are bound to “blow up” at the first sign of stress. A market loss of confidence in policy makers’ ability to control events has always been part of our Ice Age thesis. US inflation expectations in particular will fall an awful long way if investors fear the US cycle is about to fail. I have always thought that this would all end the way Christopher Wood explained in his GREED and fear publication last November: “The key issue is what might trigger a market correction . The market consensus continues to focus on the tightening in financial conditions triggered by “tapering”. Still such a hypothetical correction is not so big a deal to GREED & fear, since any real equity decline caused by tapering is likely to lead, under a Fed run by Janet Yellen, to renewed easing. The real threat to US equities is when the American economy fails to re-accelerate as forecast”. Certainly, in my view , at these elevated valuations, it will not take much to bring down the entire ‘pyramid of piffle’. Just two days before Albert penned the above, a reader sent me a link to the Salon article America’s ugly economic truth: Why austerity is generating another slowdown by David Dayen. Austerity amid recovery has been a disaster everywhere it’s been tried, and the fact that America’s course looks better right now than the more calamitous policy choices in Europe or the rest of the world brings little comfort. Anyway, a global slowdown, which appears to be the current path absent concerted action, will inevitably hit us at home. David Wessel of the Brookings Institution is right to say that this terrible outlook for economic growth represents a choice by policymakers. With borrowing costs once again near historic lows, Congress could simply decide to finance some more investments. Europe could finally put an end to the economic straitjacket it’s chosen to wear for over half a decade. That dreaded dirty word – “stimulus” – could be employed once again. For starters, austerity has never been tried. Deficit spending is still rampant in Europe. Dayen never mentions the structural problems with the euro itself, Europe's demographics, or productivity differences between France and Germany (mainly stemming from socialism and inane work rules). Instead, like most economic illiterates, Dayen believes Europe can spend its way out of trouble. The fact of the matter is fiscal stimulus adds to deficits and any alleged improvement comes at enormous expense down the line. Then, as soon as the stimulus stops, guess what happens. Compounding the problem, union work rules add to the cost of stimulus. Europe and the US both need to address massive overpayment of government workers vs. the private sector. Fix the structural problems and most of the rest will take care of itself. Dayen cheers the U.S. recovery vs. Europe. He overlooks the massive bubbles in stocks and corporate bonds. Dayen wants more stimulus. Pray tell, what the hell do you call interest rates at zero and trillion dollar deficits for years? Dayen is too bleeping blind to see that Japan tried things his way and failed. All Japan has to show for decades of deflation fighting is debt to GDP over 250%, the highest of any major county, by far. He also fails to note the housing bubble is a direct result of the Fed not taking its medicine in 2000 and 2001. The idea that the Fed can eliminate the business cycle is clearly idiotic (bubbles of increasing magnitude in 2000, 2007, and now should be proof enough). Nonetheless, that is precisely what the vast majority of economic writers believe. The writers all live in Academic Wonderland after years of Keynesian teaching. Only those who believe in voodoo can get a job at a central bank. In contrast, the average seventh-grader can see that building bridges to nowhere and overpaying for labor on top of it is doomed to fail. You have to be taught to be stupid! I have discussed these points before, most recently in James Grant Conference Video: Inflation Expectations, Growth, Policy Problems; Europe Has Become Japan. On October 19, I wrote Challenge to Keynesians "Prove Rising Prices Provide an Overall Economic Benefit" in response to an article in the Financial Times. Will the Morons Ever Learn? Albert Edwards asked "Will These Morons Ever Learn?" I added the implied words "Central Bank", but need to remove them. Just three days ago Hillary Clinton stated "Don't Let Anyone Tell You It's Corporations and Businesses that Create Jobs". How moronic is that statement? Keynesian and monetary fools are in complete control of academia, central banks, and most media. Will the morons learn? Unfortunately, no. Why? Because they are morons, and by definition they can't.